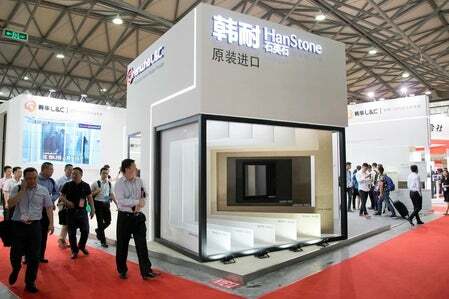 Hanwha L&C participated in the biggest kitchen and bathroom exhibition in Asia, which is held in Shanghai, China. KBC is the world’s largest kitchen and bathroom exhibition with more than 10,000 visitors. Hanwha L&C introduced new products that can be used in kitchen and bathroom at Kitchen & Bath China, KBC, in Shanghai New International Expo Centre from 31 May to 3 June. It exhibited 20 kinds of Hanstone, eight kinds of acrylic solid surfaces ‘Hanex’, 20 kinds of ‘PET deco sheet’ and interior film ‘Bodaq’. The theme of this exhibition was ‘Less, but Better’. Hanwha L&C, which has been actively participating in global exhibitions held in China, Australia, and Germany for the past three months, is concentrating on global marketing visiting China again.